Each year, the MLB Draft kindles the hopes of baseball fans and collectors alike, by introducing a new set of potential stars. Yesterday's high school phenoms and overnight into the collecting spotlight. 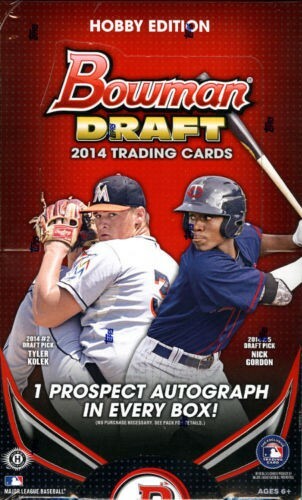 2014 Bowman Draft delivers by showcasing the very first cards of these future stars in their MLB uniforms! 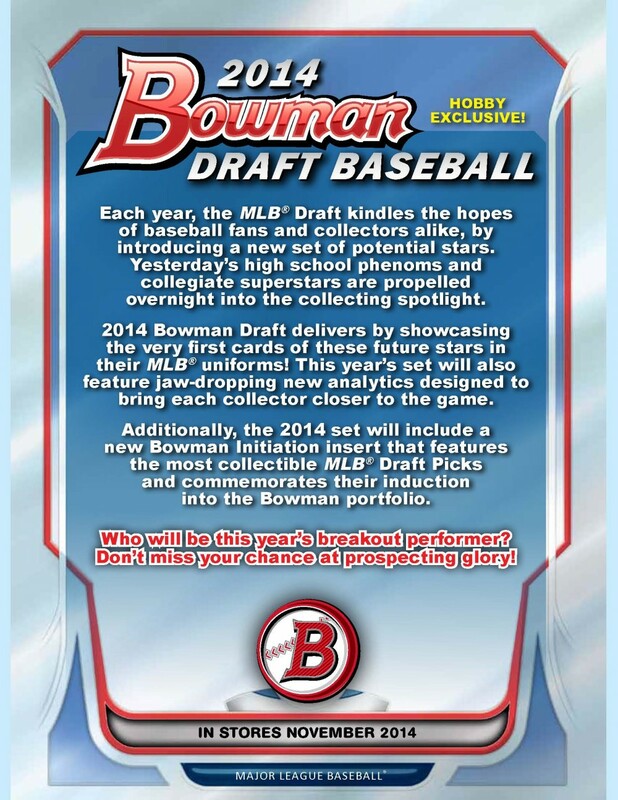 This year's set will also feature jaw-dropping new analytics designed to bring each collector closer to the game. 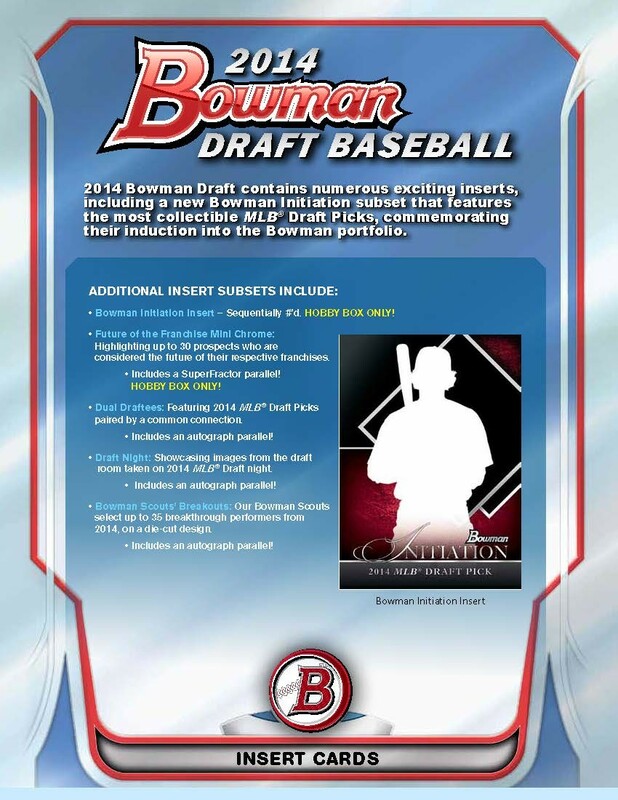 Additionally, the 2014 set will include a new Bowman Initiation insert that features the most collectible MLB Draft Picks collegiate superstars are propelled and commemorates their induction into the Bowman portfolio. Who will be this year's breakout performer? Don't miss your chance at prospecting glory! - One Chrome Autographed Card Per Hobby Box! - Blue Parallel - sequentially #'d. - Red Parallel - sequentially #'d. - Black Parallel -#'d 1/1. HOBBY BOX ONLY! - Printing Plates - #'d 1/1. - Silver Ice Parallel - Limited. - Red Ice Parallel - sequentially #'d. - Purple Ice Parallel - sequentially #'d. - White Ice Parallel - sequentially #'d. HOBBY BOX ONLY! - Refractor Parallel - sequentially #'d. - Blue Refractor Parallel - sequentially #'d. - Green Refractor Parallel - sequentially #'d. - Gold Refractor Parallel - sequentially #'d. - Black Refractor Parallel - sequentially #'d. HOBBY BOX ONLY! - Orange Refractor Parallel - sequentially #'d. - Red Refractor Parallel - sequentially #'d. - SuperFractor Parallel - #'d 1/1. - Sequentially #'d. HOBBY BOX ONLY! - Highlighting up to 30 prospects who are considered the future of their respective franchises. - Includes a SuperFractor parallel! HOBBY BOX ONLY! - Featuring 2014 MLB Draft Picks paired by a common connection. - Includes an autograph parallel! - Showcasing images from the draft room taken on 2014 MLB Draft night. 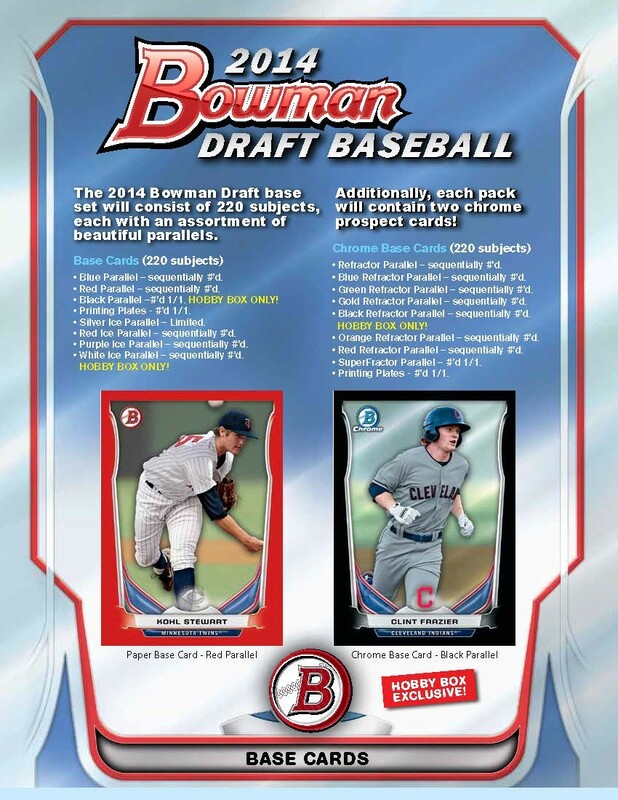 - Our Bowman Scouts select up to 35 breakthrough performers from 2014, on a die-cut design. - Blue Refractor - sequentially #'d. - Green Refractor - sequentially #'d. - Gold Refractor - sequentially #'d. - Black Refractor - sequentially #'d HOBBY BOX ONLY! - Orange Refractor - sequentially #'d. - Purple Refractor - sequentially #'d. - Red Refractor - sequentially #'d. - SuperFractor - #'d 1/1. 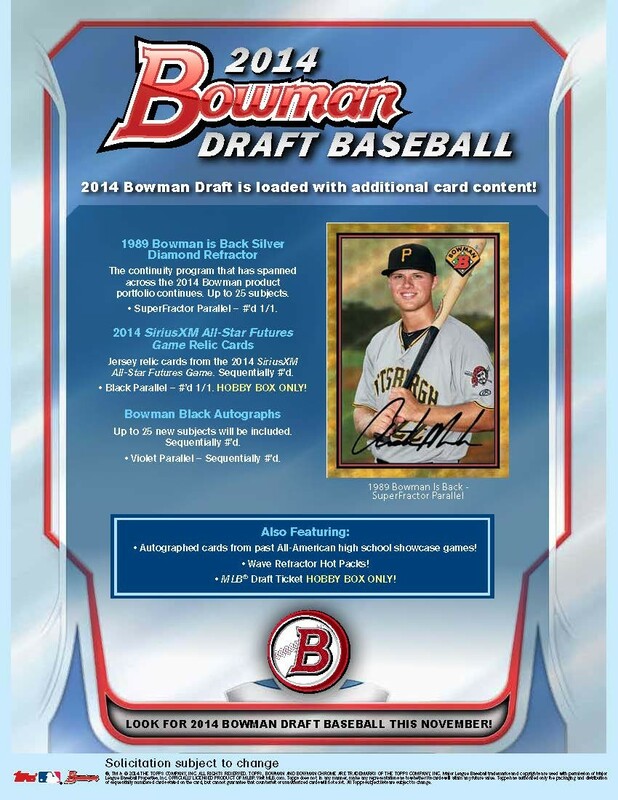 - The continuity program that has spanned across the 2014 Bowman product portfolio continues. Up to 25 subjects. - Jersey relic cards from the 2014 SiriusXM All-Star Futures Game. Sequentially #'d. - Black Parallel - #'d 1/1. HOBBY BOX ONLY! - Up to 25 new subjects will be included. - Violet Parallel - Sequentially #'d. - Autographed cards from past All-American high school showcase games! - Wave Refractor Hot Packs! 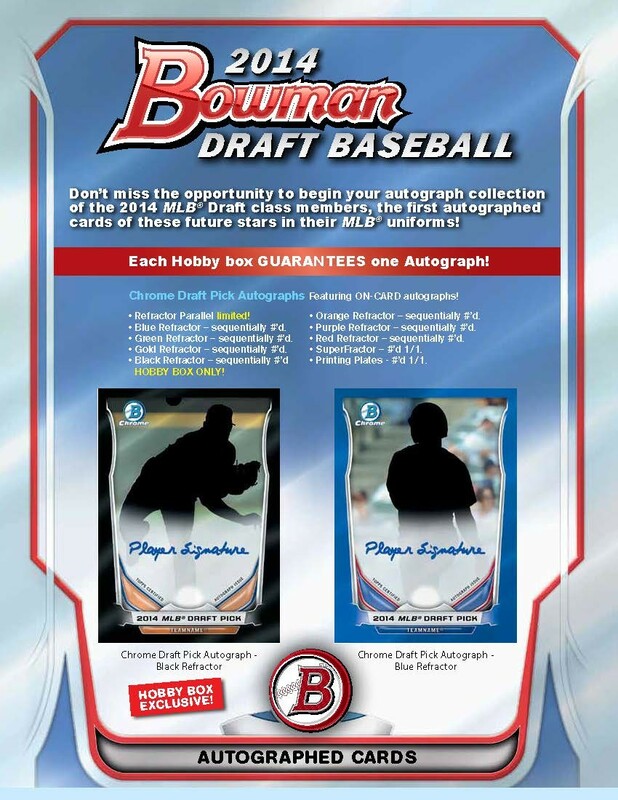 - MLB Draft Ticket HOBBY BOX ONLY!